Let’s start here: Are we going to blame every market shift on the baby boomers for the next 20-30 years? Nobody aims products (except for drugs that give the illusion of couples spending all of their time in romantic moments) at this market. Certainly, no one is marketing milk to baby boomers. Market surveys nearly always end with a category of >55, >60, or >65 – essentially lumping Baby Boomers with their parents (and dismissing them). And so, the demise of milk must be because of the Baby Boomers, right? I doubt it. 1. The extreme rise in food allergies, including dairy. 2. More people of all ages choosing to eliminate animal products from their diets. 3. Dozens of options for “milk” – so many that we all can find an alternative to stealing it from the cows. Three out of four people in my immediate family no longer drink dairy milk (one due to an allergy, two due to choice). What about your family? Do you still buy cow’s milk at the grocery store? Many thanks to my husband for trudging through the snow to get the shots. 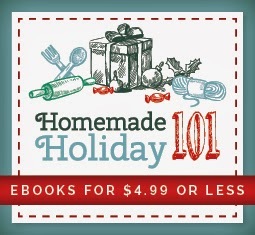 Homemade Holiday 101: ebooks on Sale! Are you still searching for holiday food ideas to accommodate multiple allergies and other custom diets? I might just have some answers for you. Workman Publishing (the distributor for my publisher, The Experiment Publishing), is running a holiday promotion. If you sign up for their newsletter you can download your choice of e-books, including Holiday Food for All. This e-book is a fabulous collection of holiday recipes that will work for a variety of food restrictions including gluten-free, vegan, and allergy-free. I am thrilled that they included the Sweet Potato Dinner Rolls from Learning to Bake Allergen-Free: it's an easy (yeast-free) roll recipe that is perfect for a holiday meal. I'm planning to make them for Christmas Eve dinner. But wait, there's more! For a limited time (until the end of the year) the e-book version of Learning to Bake Allergen-Free (in all formats) is being offered for the ridiculously low price of $2.99. Yup, you read that right. And, if you check amazon, you will see that the kindle version is priced even lower. Did you know that you can gift a specific book on a kindle? Or, ff you have the hardcopy of the book and would like a digital version, now's the time to pick it up! What Happened to the Measuring Cup? The day before Thanksgiving I broke my favorite liquid measuring cup. It was a simple 1-cup Pyrex measuring cup with red lettering. It was the perfect size. It had a compact little handle so that it fit into the dishwasher nicely. It had both ¼ cup and 1/3 cup measures. It measured accurately. What more could you want in a measuring cup? This was a measuring cup I had owned for as long as I can remember. It was likely passed down from my mother or grandmother. And, even though I had flirted with other measuring cups over the years (I did have others to use to finish my pre-Thanksgiving prep), none of them made me happy. I have a glass measuring cup that measures nicely, but the markings are raised glass rather than printed; this means that I need to do squats to see how much I’ve measured. (I’ve nothing against squats, I just don’t need to do them when I’m baking.) It even has three pour spouts, in case I need to pour sideways. (Really, who does that? I tried it once just to see how it felt and I made a big mess.) But the worst past is that due to those three spouts, it takes up more than its fair share of space in the dishwasher. I also have one of those plastic angled measuring cups, and I’d love to know who thought that was a good idea. Nothing looks right when measured at an angle. Right now the only thing I use that particular measuring cup for is to hold my measuring spoons (and it does only a fair job at that). When my favorite little measuring cup broke (sigh) I turned to amazon to look for a replacement and discovered that they don’t make it anymore – at least not in its past form. The new Pyrex measuring cup (which I bought at the grocery store) appears to be sturdy, but it’s not the same. I can read the markings – that’s a plus. It measures accurately – that’s a must. But it’s 50% larger than my old one. It’s a fat little measuring cup that could actually hold a whole ½ cup more liquid, yet the markings stop at 1 cup. (What’s up with that? Were we all spilling too much?) That design flaw, combined with an excessively large handle, means that it doesn’t fit nicely in the dishwasher. I did some research, and discovered that I am not the only one disappointed with the new liquid measuring cups. Cook’s Illustrated lays out a number of issues based on their road tests. If you are listening, please ask the elves to make me an old-fashioned measuring cup for Christmas. I promise to leave you some allergen-free cookies in return. I was recently asked to fill out a form by a food vendor that I have an informal relationship with. The purpose of the form was to gather information about (and to assess) me and my blog. I suspect that some of the food allergy readers here (who are bloggers) may have received the same form. As I was filling out the form it struck me that measurements can be deceiving—and they can incent the wrong behavior. One of the questions asked was “How many comments do you receive per blog post?” I had to check the first box on the form, “0-5 comments.” After a fleeting moment of feeling like a failure, I realized that I don’t care. Every blog has a purpose (or at least it should). I am not trying to facilitate a community with this blog. When I want community I visit Kids with Food Allergies or Freedible, or read the #foodallergy twitter stream. There are so many people (many of them bloggers) trying to build new communities, and yet I don’t have unlimited time to engage. So I pick my communities and I have no interest in leading my own. I love to visit your blogs as well, and I leave the occasional comment. When I do comment it’s usually to add additional information or to provide support (and a virtual hug). My passion is in solving problems and helping those with multiple food allergies to find solutions. That’s why I write cookbooks. That’s why I speak at conferences. That’s why I sit on the board of Kids with Food Allergies. That’s why I write this blog. If someone visits here today and feels even a tiny bit better about how to manage their food allergies that makes me feel better than a dozen comments ever could. When I receive an e-mail from a reader (of my book or my blog) that thanks me for the information I shared, that makes me feel better than a hundred comments ever could. I don’t pretend that my mission is any more noble or important than building a community – there is extreme value in our online communities and I am grateful for those who provide that service – it’s just not what I do. Don’t get me wrong, I love it when you leave a comment, and I treasure every single one of them. You are absolutely welcome to leave comments. You are also welcome to visit and not leave a comment. I am honored that you visit. I know that most of the 12000 of you who visit here each month haven’t commented and that’s entirely okay with me! Feel free to leave a comment … or not.